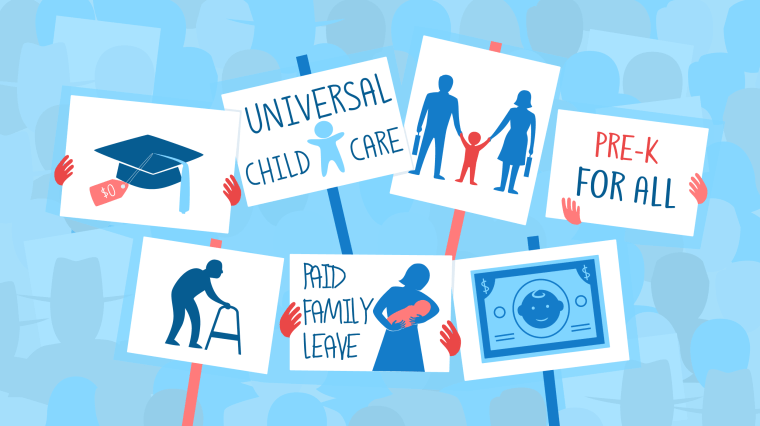 Cycle of life: 2020 candidates have cradle-to-grave proposals for universal child care, tuition-free college and larger Social Security benefits. WASHINGTON — For everything there is a season, and for every stage of life there’s at least one Democratic presidential contender with a plan to address it. From children to students to parents to retirees, the 2020 field is rallying behind an ambitious slate of economic ideas, many of which are targeted at specific parts of the life cycle. For Democrats, the potential upside is clear. These proposals could give candidates a path to woo different constituencies, both in the primaries and the general election, with big-ticket promises that speak directly to voters' pocketbook concerns. "What I'm saying is to promise everybody something," Markos Moulitsas Zúniga, founder of the liberal politics hub Daily Kos, told NBC News. "The Democratic Party is the party that should be delivering goodies for people, and it can do so." At the same time, some in the party worry the micro-targeting of policy proposals also carries a risk of pitting generations against one another or undermining a broader economic message with a confusing array of narrow plans. And, on the GOP side, opponents see a chance to portray their ambition as too costly and radical. One of the most sought-after groups for Democratic candidates are younger voters, who have faced an explosion of student debt in recent years. In 2016, Sen. Bernie Sanders, I-Vt., made free college a top-tier issue that has since become a touchstone for many millennial and post-millennial Democrats. Many of the leading 2020 candidates have named tuition-free or debt-free college as a goal. For parents of young children, Sen. Elizabeth Warren of Massachusetts released a new plan for universal child care this month. Another Democratic hopeful, Sen. Kamala Harris of California, and two who are considering running, Sens. Sherrod Brown of Ohio and Michael Bennet of Colorado, are proposing tax credits that benefit working families. Sen. Cory Booker of New Jersey is running on a pledge to enact a "baby bond" that every American would be able to redeem at age 18. Sen. Kirsten Gillibrand of New York has made paid family leave one of the top issues in her presidential campaign, and former Housing Secretary Julián Castro promised "pre-K for the USA" in his own announcement speech. For those not quite at retirement age, Brown has talked up allowing anyone over 50 to buy into Medicare, and he and several 2020 candidates, including Harris, Gillibrand, Warren and Sen. Amy Klobuchar of Minnesota, signed onto a bill this month that would permit it. For seniors, Warren was an early adopter of proposals to boost Social Security benefits, and she, Gillibrand, Sanders, Harris, Booker and Brown launched an "Expand Social Security Caucus" in September that backs related legislation. Not all of these ideas are exclusive to a specific age. AARP has made student debt a priority issue in recent years, in part because it makes it harder for Baby Boomers who are paying for their children's education to retire. Child care and family leave affect multiple generations in the same household. But taken together, they represent a growing suite of high-dollar proposals with special appeal to voters in different phases of their lives. Some Democrats see risks in the approach. Voters could interpret policies targeted at one group as coming at their expense, either by diverting resources from elsewhere, requiring new taxes or simply competing with their own priorities for the next president's attention. While polls show tuition-free college is popular, for example, some Democrats have expressed concern that the issue turns off swing voters who either don't have a college education, have paid off their loans or who don't have children who would benefit. Progressive critics also complain these proposals tilt funding and attention toward upper-middle-class students that could go to more economically vulnerable populations instead. Heading into the presidential election, Republicans from President Donald Trump down are also warning seniors that "Medicare for all" will dilute care for existing Medicare recipients, even as Democratic supporters note their single-payer plans add new benefits for Medicare like vision and dental coverage and get rid of out-of-pocket costs. Republicans are making older voters feel that "by expanding those benefits to a younger, more diverse America, that somehow that will be zero-sum gain where they have to lose," said Waleed Shahid, communications director at the progressive group Justice Democrats. "I think it’s a powerful strategy from the Republican Party and something Democrats will have to figure out how to combat." These arguments are likely to become more pronounced as Democrats rely more and more on younger voters while Republicans try to boost their margins with an aging base. Matt Bruenig, founder of the socialist think tank People's Policy Project, said he tried to take these demographics into account while crafting a package of family-oriented policies last month, including universal child care, family leave and other benefits for parents. By focusing on parents of small children, a Democratic candidate who adopted his plan could target voters who are disproportionately young, female and nonwhite, allowing them to excite several base constituencies at once. "It's a neat package, I think, in terms of hitting all these groups that the Democratic Party is made up of," Bruenig said. The president and his allies are already laying the groundwork to make the election a referendum on whether Democrats have gone too far in promising expansive new programs. At CPAC, the annual conservative gathering, many participants devoted their speeches last week to decrying the Democratic agenda as part of a broader slide toward "socialism," a label only Sanders has embraced among 2020 candidates. "Bernie has been joined by a chorus of candidates and newly elected officials who have papered over the failed policies of socialism with bumper-sticker slogans and slick social media campaigns," Vice President Mike Pence said in his remarks. "What they're actually offering is just more the same: more taxes, more spending, more government and less freedom." Fox News host Laura Ingraham accused Democrats of "dangling freebies to a new generation." By framing the policy debate as one about the nation's overall direction, Republicans hope to neutralize Democrats' polling advantage on some of their proposals. "While individually these programs all appeal to one group or another, Republican and independent voters still reject socialism," said Chris Wilson, a Republican pollster who worked on Sen. Ted Cruz’s 2016 presidential campaign. "If the fight becomes about socialism rather than what government can hand out to a narrow group, Democrats will lose at the polls." This isn't a new approach, though Republicans hope it resonates more as Democrat grow bolder in their platform. President Barack Obama faced similar attacks, including from conservatives who mocked a campaign slideshow that depicted how a fictional woman, "Julia," would benefit from his policies at every stage of her life. Just as Republicans are looking to turn dozens of individual policy debates into a coherent story about their values, Democrats are warning that their candidates need to do the same thing. As campaigns look to one-up one another with each new policy rollout, some are concerned that the debates could confuse voters who are trying to determine each candidate's overarching approach. "We have so many issue constituencies who are very active in politics and they all tend to push for their smaller policy," Democratic pollster Celinda Lake told NBC News. "What Democrats need to watch for is to not be seduced by the individual popularity of all these policies and instead connect them in a way that's bigger." Pete Buttigieg, 37, the mayor South Bend, Indiana, has made the most explicitly age-focused appeal in the Democratic presidential field so far, arguing that a younger politician better understands issues with long-term consequences for "intergenerational justice" like climate change and debt. But Buttigieg also told NBC News he's wary of dwelling too much on wonky proposals aimed at millennials or any other group, which he worries can distract from the broader discussion of his governing philosophy. "It's not so much about creating a particular gift for a particular slice of the population," he said. "I think it's more about taking the future into account more heavily."